Jakob Maché & Roland Schäfer: From Parts of Speech to Parts of Body. Conference of the International Society for Gesture Studies 2010, Frankfurt/Oder. 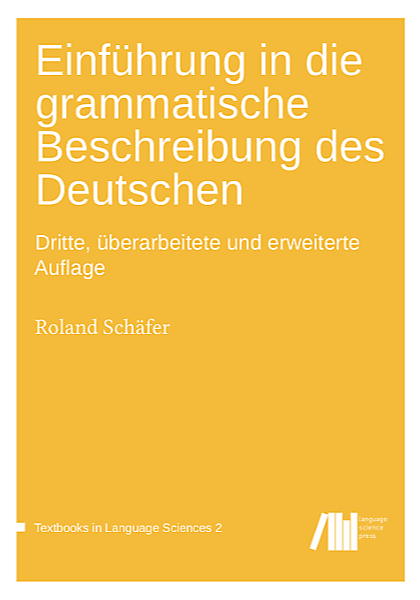 In this talk we examine strategies of the encoding of specific types of gestures and involuntary indexical body motions in linguistic expressions in contemporary German. We show that powerful generalizations can be derived as to how descriptions of motions of body parts, the volitionality of these motions, and grammatical properties of the verbs used in the descriptions interact. Our research is based on a corpus study investigating 28 types of potentially idiomatic expressions which describe motions of body parts, where analysis was carried out quantitatively as well as qualitatively. For that, approximately 15,000 sentences were sampled from the COSMAS Corpus of the IDS Mannheim (3,6 billion words). Idiomatic expressions are conceived as being constructed like normal linguistic expressions, but having mostly lost their literal meaning in favor of a a non-literal, non-compositional interpretation (e.g., Katz & Postal 1963). Seldom should the literal meaning be expected to surface (cf. Langlotz 2006, chapter 1). Burger (1976) describes a class of potential idioms as representing a special case of motivation. So-called kinetic idioms (“Kinegramme”) like “den Kopf schütteln” (shake one’s head) are not understood by him as being idiomatic, although they seem to bear a symbolic meaning (in the case of the given example that of denial or negation). Interestingly, Burger points out that such expressions do not in themselves realize both a literal meaning (he presupposes that one has to actually shake one’s head for the expression to be applicable) and a non-compositional symbolic one (here, the conventionalized intentional gesture of denial/negation). Instead, the expressions are understood as describing simply the motion which is then in itself ambiguous between an unvoluntary reaction and a symbolic gesture. Turning to our research, we have found that many of the 28 constructions can be used to describe situations where the motion is not actually performed (cases which Langlotz 2006 briefly mentions as an extreme case of metaphorical kinetic idioms), thus refuting Burger’s claim of the strict double motivation of such constructions. Turning to the grammatical structure of the constructions, we find that some of them are [verb + accusative], some are [verb + prepositional phrase headed by “mit” (with)] (which we call instrumental), like “mit den Knien schlotteren” (literally “shake with the knees”). We show that the items in the class of constructions with the instrumental are on the one hand intransitive verbs which predominantly do not have a prototypical volitional agent in their conceptual structure (Dowty 1991) (unaccusatives like “schlottern”) and on the other hand intransitive verbs which conceptually involve such an agent (unergatives). We take for granted here a grammatical operation which adds the instrumental in such cases to describe the specific body part undergoing the motion (to be motivated by us elsewhere). We go on to show that the class of kinetic constructions with an instrumental based on unaccusative verbs is dramatically under-represented in the corpus. In fact, there are competing constructions, e.g. “mir schlottern die Knie” (literally “me shake the knees”) as described by Wegener (1990), which are typically used to describe such involuntary motions. Furthermore, all these unaccusative verbs, by virtue of not describing intentional actions, cannot describe motions which turn into conventionalized gestures (for which volitional control of the motion is substantial), and in fact this generalization is fully supported by our corpus data. They can maximally be turned into more or less conventionalized linguistic metaphors for other non-volitional experiences and mental states (Widerfahrnisse in the terms of Kamlah & Lorenzen 1967), like “mir schlottern die Knie” for “being frightened”. The well-established grammatical verb classes and the linguistic constructions containing them thus map perfectly to the volitional gesture/involuntary motion dichotomy. Our research clarifies some distinctions and motivations in a class of linguistic constructions prominently described by Burger. It shows potential for further typological grammatical research. For example, the majority of the English correlates of the examined German expressions have an obligatory pre-nominal bound genetive, as in “clap one’s hands”. Furthermore, investigation of the degrees of conventionalization of gestures in different languages could be further investigated, offering perspectives for intercultural studies.